Until this past week, I’d never made biscotti. And to be honest, I’d probably only tried it once or twice in my life. Classic biscotti recipes are naturally dairy free, but a lot of brands and newer recipes use butter. And of course, that chocolate dunk usually contains dairy. So coffeehouse options are usually off limits. But I wanted to send a care package to a friend across the country, and needed a baked goodie that could safely weather shipping. And so began my whirlwind journey into homemade dairy-free biscotti. Sarah at No Whey Mama is my lead recipe tester. She’s been working with Go Dairy Free for maybe 6 years or so now. She and her daughter even write our popular monthly Kids Can Cook section! I wanted to let her know how much I appreciate everything she does, and give her a little treat to help her during this busy back to school time (she has 4 kids!). I actually cheated a little, and asked Sarah what would be a good baked treat for a mom that would ship well. Of course, I didn’t say that it was for her! She picked dairy-free biscotti, and I knew she would appreciate the chocolate dip, too. 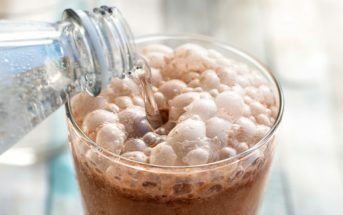 I also included some of my favorite dairy-free conveniences in the care package to help energize her in the morning – Bob’s Red Mill Chai Protein Powder Nutritional Booster and Gluten-Free Granolas in Apple Blueberry and Honey Almond. 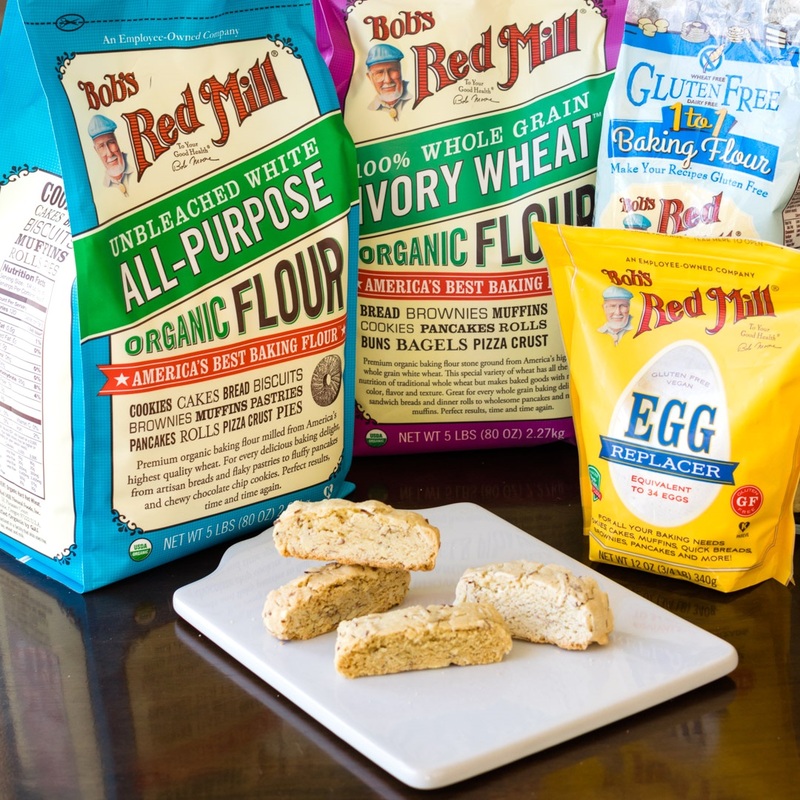 These three items are made in the dairy-free, gluten-free facility at Bob’s Red Mill, so I was confident that they would be safe for her to enjoy without worry about cross-contamination for her milk allergic teen. 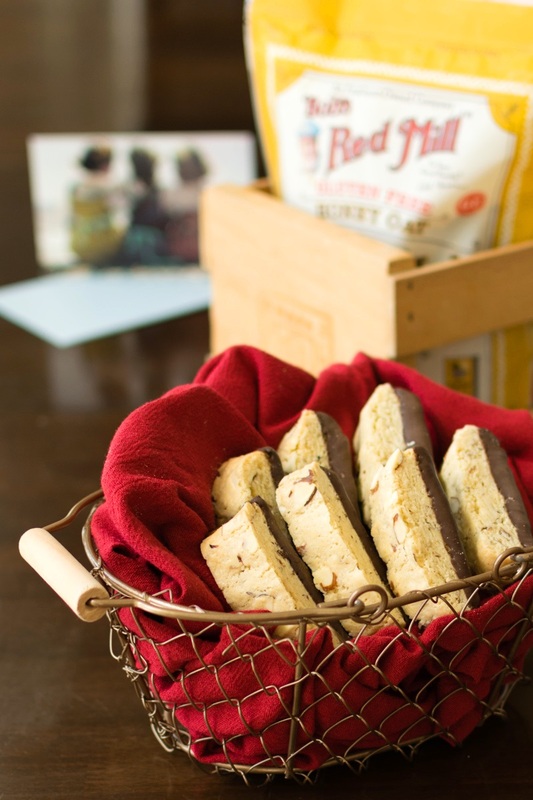 Sarah does so much recipe testing for our contests and my books that I knew she would appreciate trying this dairy-free biscotti many different ways. 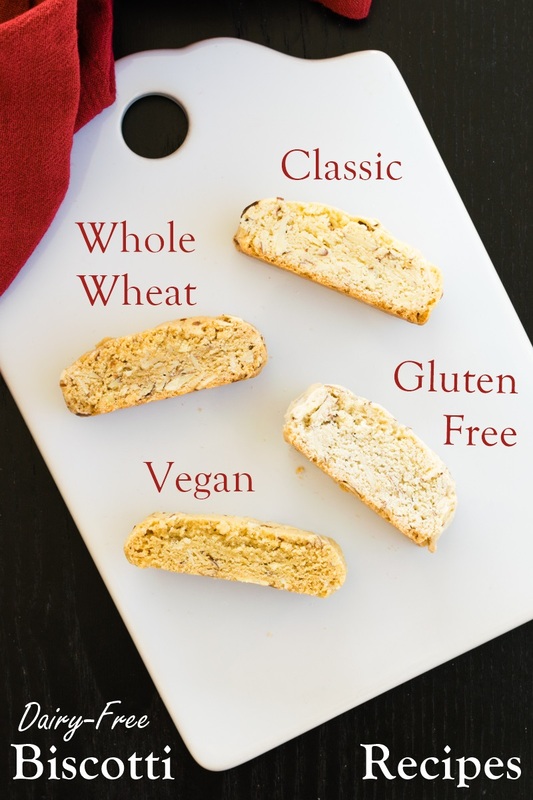 And since Bob’s Red Mill has just about every baking ingredient covered, I decided to test my dairy-free biscotti recipe four different ways: classic white, 100% whole wheat, gluten free, and vegan. This really is a spot-on, easy, classic dairy-free biscotti recipe. It’s hard to go wrong with this lightly sweet, crispy cookie that dunks with perfection. Follow the original recipe below and enjoy. In this version, I simply swapped organic ivory wheat flour for all of the all-purpose flour. These are a touch more fragile, so they benefit from a longer cooling time before slicing. Even so, expect a few crumbles. The taste is still delicious and crispy, but it’s a little heartier and has more of a savory-sweet vibe. If you want to add a little whole wheat nutrition but maintain more of the original biscotti integrity, use just 3/4 cup Ivory Wheat Flour and 1 cup All Purpose Flour for the flour. Use 2 cups gluten free 1-to-1 baking flour in place of the all-purpose flour. I know, this isn’t quite 1-to-1, but you need to be able to shape the dough and it’s just way too sticky without a little extra. Even with the full 2 cups, the dough will be very sticky. But you should be able to scrape it onto your parchment-lined baking sheet and shape it with damp hands. Also, increase the initial baking time up to 40 minutes, and note that it will still look pale in color and will just brown a little on the bottoms. On the second baking, increase the time to 15 to 20 minutes. Despite the changes, these have a delightful finish with a wonderful taste and texture. The gluten-free version isn’t quite as “crisp” as the classic dairy-free biscotti recipe, but each bite is a little lighter and flakier. Thus far, I’ve only tested this version with all-purpose flour. I haven’t ventured two degrees of separation with both vegan and gluten free. Simply swap 1 egg replacer (1 tablespoon powder + 2 tablespoons water) for the egg. The dough is much stiffer, so you may need to add an extra splash of water to work the almonds in, if using. 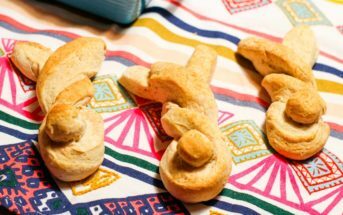 Even though it is stiff, the dough spreads more, so they are longer, flatter dairy-free biscotti with more of a “crunch”. To help with the rise, you may want to increase the baking powder to 1 1/2 teaspoons. This post is sponsored by Bob’s Red Mill, but the recipe, photo, idea, and opinions are my own. I hope it inspires you to bake up a care package for someone you know! Check out more delicious healthy recipes, snag coupons and find stores near you at BobsRedMill.com! By ingredients, this recipe is dairy-free / non-dairy, optionally egg-free, optionally gluten-free, optionally nut-free, peanut-free, soy-free, optionally vegan, and vegetarian. See the “Variation Notes” above for the options. This recipe was my first foray into homemade dairy-free biscotti, but I couldn't stop with the classic. I tested classic, whole wheat, gluten free, and vegan variations, too! I've included links in this recipe to the specific ingredients that I used. Preheat your oven to 300ºF and line a baking sheet with parchment paper. Put the flour, baking powder, and salt in a medium bowl and whisk to combine. Put the sugar, oil, and vanilla in a medium mixing bowl and beat with a hand mixer to combine. Add the eggs and beat until relatively creamy, about 1 minute. Stir in the flour mixture. Add the 1 cup almonds and work them into the very thick dough with your hands. Divide the dough in half. Roll one half into a narrow log that's 12-inches long. If the dough is sticky to handle, lightly wet your hands to avoid sticking. Place the log on one side of your prepared baking sheet and lightly flatten it to about 2 to 3 inches wide. It won't spread much. Repeat with the other half of the dough. Bake the logs for about 35 minutes, or until lightly golden. Let cool on the baking sheet for 10 minutes, then remove the logs to a cutting board to cool for another 10 to 20 minutes. Reduce your oven temperature to 275ºF. Trim the uneven ends and eat them. You've earned a taste at this point! Slice each log into 16 (3/4-inch thick) slices using a large knife slicing straight down. Do not saw and do not use a serrated knife. For relatively even slices, I cut each log in half, and continue cutting each piece in half until I have 16 pieces. Place each piece back on your parchment-lined baking sheet, cut side down. Baking on their sides keeps the bottoms from browning further. Bake for 7 minutes, flip the slices, and bake for another 3 to 8 minutes, or until dry to the touch. Once the dairy-free biscotti are completely cool, melt the chocolate chips with the oil or shortening in a small, shallow bowl. Dunk the bottoms of the biscotti in the chocolate, and let any excess drip off. Place them chocolate side up on a wire rack to set. If your room is too warm, you may need to place the rack in the refrigerator for 15 minutes to help the chocolate set up. Store in an airtight container at room temperature for up to 3 weeks. They can also be individually wrapped in plastic and frozen to preserve freshness. Alisa, these look absolutely delicious! 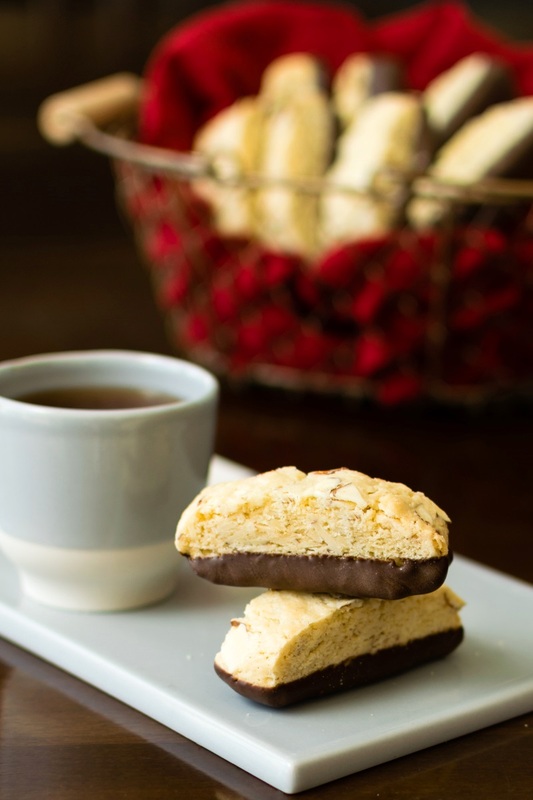 I love biscotti because they have that perfect touch of sweet and such a great crunch. I’m definitely putting them on my list. And your photos are great too! I’m a new biscotti fan 🙂 Thank you! What a fabulous idea – I can imagine a whole plate of these getting snapped up super fast! I love making biscotti! I usually only make it over the holidays because it takes some time, but it’s so worth it. The chocolate dip on yours looks amazing! Now that I know how easy it is, I may have to make it more often, too! Haha, I know we did! Ooh yes, something about those flavors together is divine. I’ve never made biscotti before but you make it look so easy! I love that you included info to cater to all the different dietary needs one might have. Totally going to try this! It really is easy Whitney, I promise! You must try it. It is SO good dipped. ALL ABOUT THE VEGAN yummy treats. These ones look and sound sooooo good! YUM! I love biscotti. I think I’d love it even more dairy-free! Definitely saving this recipe and hope to make it soon! I think you would too Christine since classic Italian biscotti is naturally dairy free! In the US, it’s just so common to add dairy to everything! I love everything about this post and recipe! I always feel so fancy when I eat biscotti with my coffee! 😉 Thank you for showing all the outcomes with the different flour variations, that’s super helpful! I honestly never saw the appeal before Laura, since I don’t drink coffee. But I dunked these beauties in my tea and now I’m hooked! I loveeee biscotti! And these options are great! I’ve only ever made a whole grain biscotti but would definitely try the gf and vegan options! I can’t lie that the Classic really is spot on, but I’m with you in that I love whole grain Ashley! I tried them with coconut sugar, too, also delish! I’ve only made biscotti a few times, and I found it to be tricky. I like to eat it, when I can find vegan versions, though! I love that you dipped it in chocolate! Thanks Dianne! The vegan version was a little trickier, but still comes out really nice! Biscotti is one of those things that completely intimidates me. Maybe I’ll be brave and try it out! You should – it’s actually so, so easy Rachel! I was surprised myself. Something about the double baking makes it seem more complicated than it is I think. Thank you so much for all the testing and options! This is awesome. 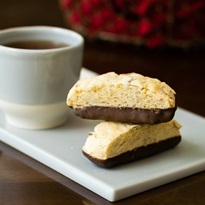 I love biscotti but have never made it, will definitely have to try your recipe. 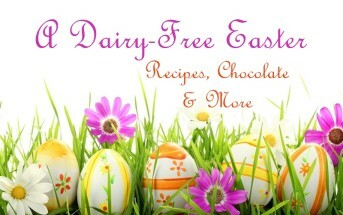 It is so much easier than I expected Deryn and nearly foolproof – enjoy!! They are so good! I just enjoyed one with some chocolate almond milk. I can’t decide which variety is my favorite. And I shared the granola with the kids for breakfast. 🙂 i think smoothies with the Chai Protein Powder are on the menu for tomorrow!